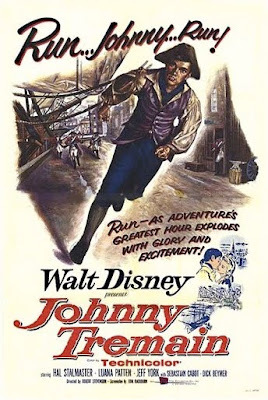 Like many Disney films of the 1950's and 60's, Johnny Tremain started as a two part episode of the Disneyland TV series. Based on the novel by Esther Forbe's, the film tells the story of a fictional character who lived during the Revolutionary War. Disney fans might recognize a familiar face. Johnny's love interest is played by a teenage Luana Patten, one of Disney's first contract stars from Song of the South and So Dear to My Heart. This was also the first Disney film directed by Robert Stevenson, who would go on to direct many classic Disney films, including Mary Poppins. Johnny Tremain is a silversmith's apprentice who is secretly a relative of Johnathan Lyte, the richest man in Boston. When Johnny's hand is injured while repairing a cup for Mr. Lyte, he reveals his relation to him only to be locked in jail for allegedly stealing. After being freed by Paul Revere, he joins the Sons of Liberty and helps at the Boston tea party. From there, Johnny serves as a spy, finding out information about the red coats plans. He joins the revolutionary war to fight for America's freedom, winning the heart of his friend Priscilla. Johnny Tremain premiered on June 19th, 1957. Information about its box office earnings and critical reception are hard to obtain, but the fact that it was shown on TV only a year later leads me to believe that it was not a big success. However, time has kept this film alive, in large part due to the success of the book. I was required to read the book as part of my elementary education and we subsequently watched this film in class. It is something that has stuck with me ever since. It's a wonderful and uplifting film about the American spirit and why its so important to stand up for what you believe in. This film was the inspiration for an unbuilt area of Disneyland that was to be called Liberty Street. However, that idea would be reused in 1971 when Walt Disney World opened. One of the lands of the Magic Kingdom is called Liberty Square and at the heart of it is the liberty tree, full of lanterns just like in the movie. Walt Disney's Johnny Tremain was released on DVD in 2005 and is still available. The film is presented in fullscreen, although it was originally released in widescreen. The film is accompanied by a promotional piece from the Disneyland series that promoted the film's theatrical release, as well as Walt Disney's original television introductions to both parts of the film. It is available on iTunes in widescreen where it is also available in HD, but there aren't any bonus features with the digital copy.